Pork and shellfish have a natural affinity for one another. 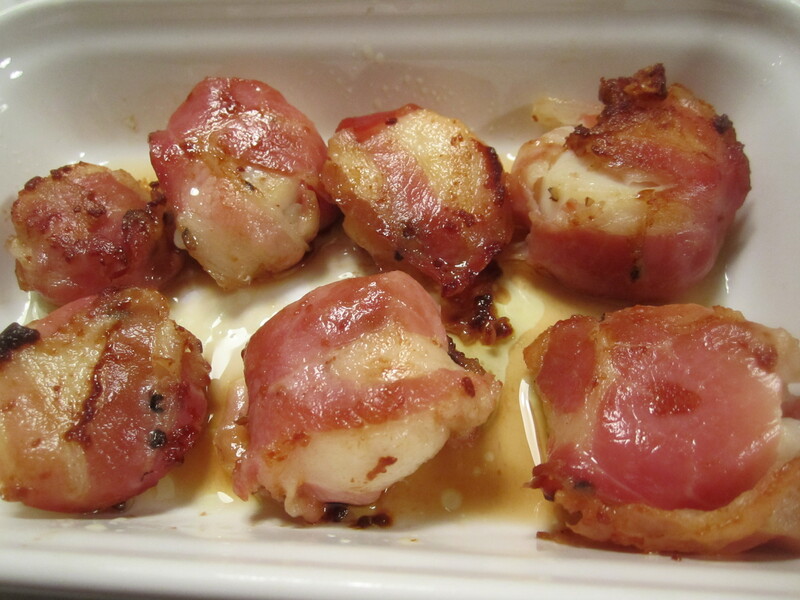 The sweetness of scallops are greatly enhanced by the saltiness of pancetta or bacon. I happened to have some very thinly sliced pancetta in the fridge and I knew it would make the perfect salty crust for my sea scallops. The thinness of the pancetta is the most important factor in this dish–it needs to be able to drape over and around the scallop and practically melt into it. 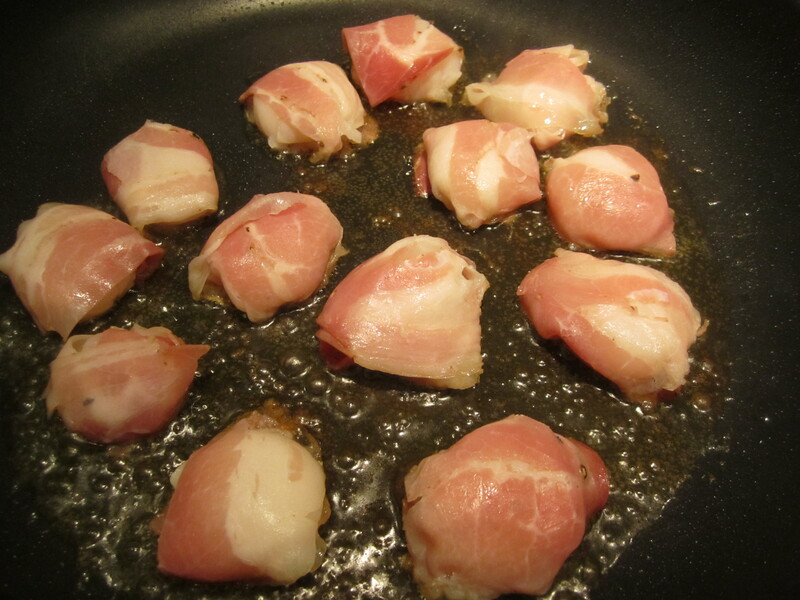 If the pancetta is not thin enough, it will simply toughen and separate from the scallops as you cook it. No recipe is necessary here–this is a very simple procedure. 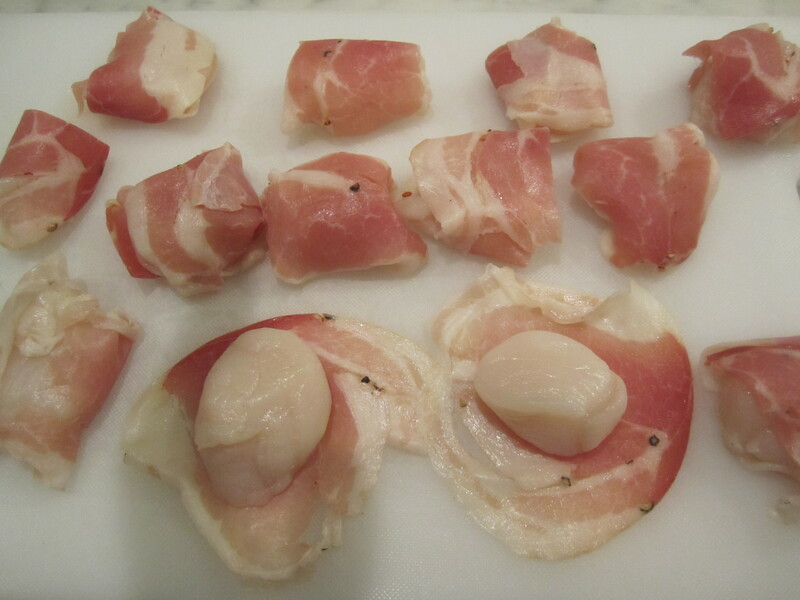 Simply lay out the slices of pancetta on a board and place a scallop over each slice. If the scallop is too big or the slice of pancetta too small to encase the scallop, add another piece of pancetta on top and press the pancetta together to form a nice little bundle. No need for toothpicks–the pancetta will melt and adhere as it renders and crisps. Place in a broad skillet containing 2 tablespoons slightly preheated olive oil on medium heat (high heat is not necessary here). Allow the bundles to cook for about 3 or 4 minutes on the first side. Gently flip each bundle with two spatulas. Allow to turn golden on the second side (another 3 minutes or so). 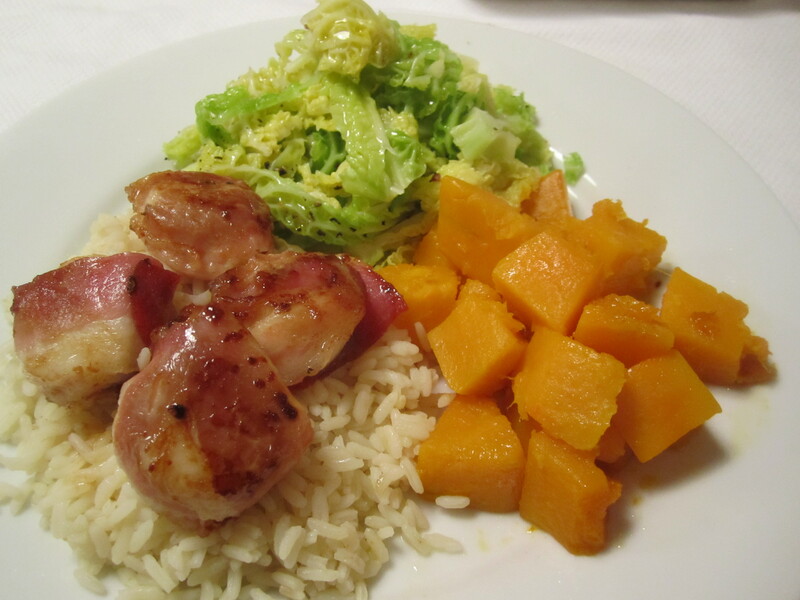 Tonight, along with the scallops, we had sauteed savoy cabbage, plain boiled rice and sauteed kabocha squash–all quiet, neutral pork-friendly accompaniments.